LOUISVILLE, Ky. (Friday, May 6, 2016) – Under clear skies, the 20 runners forSaturday’s 142nd Kentucky Derby Presented by Yum! Brands (GI) took advantage of a fast track for their Friday morning exercise. Similar conditions are expected Saturday morning when the track will be open for training from 5:45-8 with the 5:45-6 window reserved for Kentucky Derby runners. Saturday’s forecast calls for sunny skies and temperatures reaching into the low 80s. BRODY’S CAUSE/CHERRY WINE – Trainer Dale Romans declared Brody’s Cause is “ready to go” in Saturday’s Kentucky Derby (GI) after the Albaugh Family Stable’s colt galloped 1 ½ miles at Churchill Downs Friday. Brody’s Cause, who captured the Blue Grass Stakes (GI) at Keeneland last time out, will break from the No. 19 post position in the Kentucky Derby. The Romans-trained Cherry Wine, who was entered and was the second also-eligible for the Derby, didn't draw into the race Friday morning and is likely to be pointed to the Preakness Stakes (GI) at Pimlico May 21. CREATOR/GUN RUNNER – Trainer Steve Asmussen was all smiles after watching WinStar Farm's Creator and Winchell Thoroughbreds and Three Chimneys Farm'sGun Runner gallop Friday during the 5:45-6 a.m. training period reserved for Derby runners. Exercise rider Abel Flores was on Creator and exercise rider Carlos Rosas was on Gun Runner. Asmussen is thrilled with how the colts are going into the race. Asmussen, 50, who is entering the Hall of Fame this year, is seeking his first Kentucky Derby victory. He saddled two in-the-money finishers – Curlin in 2007 andNehro and 2011 – from 13 Derby starters. Curlin finished third, behind winner Street Sense and Hard Spun before winning the Preakness en route to being named Horse of the Year. Nehro finished second to Animal Kingdom. On Saturday, a dead heat for first between Creator and Gun Runner would be the ultimate result for Asmussen. DANZING CANDY – Danzing Candy’s penultimate preparations for Derby 142 consisted of nearly a two-mile gallop under exercise rider Rolando Quinones at 5:45Friday morning. Back at the barn after the gallop, trainer Cliff Sise Jr. reported that Halo Farms and Jim and Dianne Bashor’s Danzing Candy “galloped great” and will train Saturdaymorning. Sise, a Derby rookie, said he is not nervous, at least not yet. “Maybetomorrow,” Sise said with a smile. DESTIN/OUTWORK – Trainer Todd Pletcher’s Derby duo of Destin and Outworkwere the first two on the track Friday morning when the Churchill Downs folks reserved the track for Derby and Oaks runners between 5:45 and 6. Both horses galloped on a sweet Kentucky morning. Destin had his usual guy, Ovel Merida, in the tack and Outwork was partnered by his regular exercise rider, Hector Ramos. Destin stretched his legs for about a mile and a quarter, while Outwork covered a mile and an eighth. As has been the case for the previous 15 Derbys in which he has started a horse, Pletcher has his family in town. Joining him trackside this morning to watch his colts go was his father, J.J. The trainer was asked if there were any of the other Derby horses he’d seen this past week that he had a special respect for. EXAGGERATOR – The California-based colt Exaggerator put in his final bit of preparation for Kentucky Derby 142 Friday morning, going trackside with assistant trainer Julie Clark leading him out through the six-furlong gap at approximately 7:45, then taking him down into the mile chute to stand for about five minutes and take it all in on a beautiful Louisville morning. The Curlin colt had regular exercise rider Peedy Landry aboard and they set out when ready for a one-mile gallop around the big Churchill Downs oval. Beforehand, back at Barn 25, a gathering of connections and friends looked on eagerly as the colt got ready for his exercise. They traded introductions and well wishes, especially for the Desormeaux brothers, Keith who trains Exaggerator and Kent who rides him. The bubbly Kent was asked if he was ready for Saturday’s Derby. The more reflective Keith was asked if he was happy with where his charge was coming into the biggest challenge of his young career. Laoban did train at Churchill Downs on Friday, jogging two miles with a pony at 7 a.m. He was scheduled to leave the backstretch at 10 a.m. on a van bound for Keeneland, where Guillot will prepare the son of Uncle Mo for the Preakness (GI)May 21. Guillot said McCormick Racing LLC and Southern Equine Stable’s Laoban will work at Keeneland on Sunday and then again the following Sunday, before shipping to Maryland on May 17. The trainer also said he is might bring recent Keeneland maiden winnerFearless Dragon to run in the Sir Barton on the Preakness undercard. LANI – Koji Maeda’s Lani combined a mix of walking, jogging and galloping into four circuits of the main track early Friday morning with exercise rider Eishu Maruuchi aboard. Trainer Mikio Matsunaga indicated that Lani would go to the track in the morning. For Matsunaga and Maruuchi, the Kentucky Derby is another stop on a long journey that includes a victory in the UAE Derby (Group II) on March 26 in Dubai. Maruuchi has been Lani’s only exercise rider. “Eishu has been getting on him since the first day he arrived in the barn and he also was the exercise rider for his mother (Heavenly Romance),” Matsunaga said. Maruuchi was not quite sure what the future would hold for Lani the first time he rode him. Maeda as well as jockey Yutaka Take are scheduled to arrive in Louisville this afternoon. Matsunaga was asked what his first Derby Day would be like for him, including the walkover from the barn. Lani will be the last horse to be in the walkover procession. MAJESTO – Grupo 7C Racing Stable’s Majesto galloped once around the Churchill Downs racetrack Friday morning. The 3-year-old son of Tiznow earned a spot in the Kentucky Derby field by finishing second behind Saturday’s morning-line favorite Nyquist in the Florida Derby (GI) at Gulfstream April 2. Trainer Gustavo Delgado is hopeful that Majesto will be able to make up the 3 ¼ lengths that separated his late-developing colt and Nyquist last time they met. “I think there’s going to be a lot of speed tomorrow. It’s possible it can help me, because Nyquist in Florida was in the front all the way. 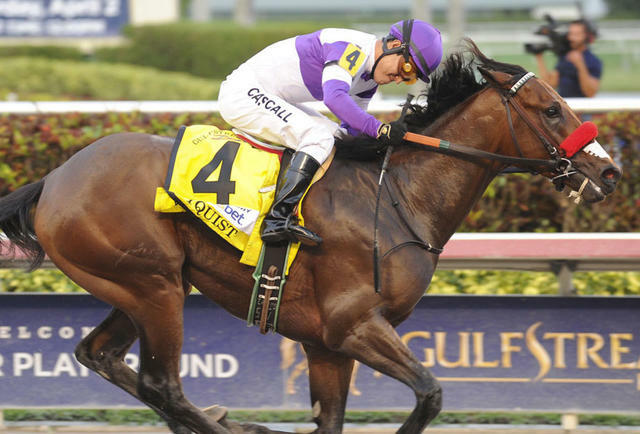 Tomorrow, there looks like there’s a lot of speed to go with Nyquist. That’s my hope. I think my horse will be in the middle. I want him to run the last five furlongs. “Remember, in the Derby, you need luck. Anything can happen. MOHAYMEN – Shadwell Stable’s Mohaymen galloped a 1 ¼ miles at Churchill Downs Friday morning to the satisfaction of trainer Kiaran McLaughlin. The son of Tapit won his first five races before turning in a subpar fourth-place finish behind Derby morning-line favorite Nyquist in the Florida Derby (GI) at Gulfstream Park April 2. McLaughlin expects Mohaymen to revert back to the form he showed while winning the Holy Bull (GII) and Fountain of Youth (GII) at Gulfstream. MOR SPIRIT – Michael Petersen's Mor Spirit galloped 1 1/2 miles Friday under regular exercise rider George Alvarez just before 7 a.m. as he completed his Kentucky Derby preparations for four-time winner Bob Baffert. A fifth victory would place the Hall of Fame trainer solely in second place behind the legendary Ben Jones, who has six wins. He is tied in second with D. Wayne Lukas and Herbert Thompson, who also have won the Run for the Roses four times. MO TOM – G M B Racing's Mo Tom, with exercise rider Mario Garcia aboard, galloped two miles Friday during the training period reserved for Derby horses. As is his style, Mo Tom picked up the pace on his second lap around the one-mile track. That comment was a reference to Mo Tom's troubled trips in the Risen Star and Louisiana Derby. He had to be checked by jockey Corey Lanerie in the stretch in both races. MY MAN SAM/SHAGAF – Trainer Chad Brown's Kentucky Derby duo completed their Kentucky Derby preparations by galloping 1 3/8 miles Friday during the special training time. Daniel Bernardini was on My Man Sam and Gian Cueva was onShagaf. NYQUIST – Kentucky Derby favorite Nyquist went to the racetrack at 7 a.m. Fridayfor the icing on the cake, so to speak, in his preparations for America’s most famous race. The sleek bay son of Uncle Mo had regular exercise rider Jonny Garcia on his back and stable assistant trainer Jack Sisterson alongside on a pony. They backtracked twice around the Churchill strip, jogging strongly with Sisterson’s right arm getting a solid workout as he held tight to Nyquist. There was a moment of concern during the exercise when a loose horse caused some commotion on the backside, but Garcia and Sisterson were on the frontside when it happened and not bothered by it at all. The usual substantial crew around trainer Doug O’Neill’s “Team O’Neill” was on hand to observe their undefeated star’s last bit of work prior to Saturday’sshowdown with 19 3-year-old rivals. Among them was a California guy named Tom Knust, who was readying to take in his 20th Kentucky Derby. Knust is a savvy racetrack veteran with a full head of silver/gray hair who, after a hitch in the Marine Corps that included a purple-heart trip to Vietnam, enrolled in the University of Arizona’s Racetrack Industry Program and earned a degree in animal husbandry. Subsequently, he held a series of racetrack jobs from stall superintendent to racing secretary at such major Thoroughbred outposts as Santa Anita, Oak Tree and Del Mar, as well as Canterbury Downs. That background morphed into what has become his main calling – jockey agent. And he’s good at it. He’s called the shots for about a dozen riders, many of whom racing fans readily know. Among them are Kent Desormeaux, Patrick Valenzuela, Corey Nakatani, Richard Migliore, Jon Court, Elvis Trujillo and David Cohen. He has been to the Derby six times previously with a rider – twice with Desormeaux and Valenzuela and once each with Trujillo and Kevin Krigger. Now he’s here with Mario Gutierrez and he believes that this go-round with Nyquist will be his best chance to break through and smell the roses up close. Knust is on his second tour with Gutierrez, having been his guy for a year once previously before rejoining him in California about a year ago. “Mario is a great kid to work with,” Knust said Friday morning near Nyquist’s stall in Barn 41. “Good attitude; hard worker. He and his wife are terrific people. She’s pregnant with their first child now; she’s due the first week in September. They know it is a boy and they’re very excited. “And Mario just has his head on right currently. He’s riding exceptionally well. He and Nyquist get along so well. They know each other. Doug (O’Neill) has done a great job getting the horse ready for this and I really feel that this is the best horse I’ve ever been here with, the horse that offers me my best shot yet at this race – by far. OSCAR NOMINATED – Ken and Sarah Ramsey’s Oscar Nominated galloped a mile and an eighth Friday morning at 5:45 during the 15-minute training window reserved for Derby starters. Coming off the track, the son of Kitten’s Joy was a bit rambunctious but trainer Mike Maker’s exercise rider, Joel Barrientos, was always in control. “That’s just him; he’s a high-strung horse and always a little worked up when he comes back from the track,” said Nolan Ramsey, the 19-year-old grandson of the Ramseys and an employee of Maker’s. The progeny of Kitten’s Joys, like their sire, are known for their turf prowess. Oscar Nominated, who was claimed by the Ramseys last fall for $75,000 out of a maiden turf race at Belmont Park, has yet to race on a dirt surface, but his connections have confidence that won’t be an issue. Ramsey said Oscar Nominated will work the shedrow Saturday morning. SUDDENBREAKINGNEWS – Samuel F. Henderson's Suddenbreakingnewscompleted his pre-Derby preparations by galloping 1 5/8 miles under regular exercise rider Ramiro Gorostieta during the 5:45-6 a.m. training time. “He's happy,” trainer Donnie Von Hemel said. TOM’S READY – G M B Racing's Tom's Ready, with exercise rider Emerson Chavez aboard, galloped a mile and a half Friday morning during the training period reserved for Derby horses when the track opened. Trainer Dallas Stewart, accompanied by a group including G M B racing manager Greg Bensel, was standing on the track to get a clear view of the exercise. G M B Racing is the stable of Gayle Benson, wife of New Orleans Saints owner Tom Benson. Bensel is the Saints' senior vice president of communications. Stewart was wearing a Saints stocking hat Friday morning. TROJAN NATION – Trainer Paddy Gallagher had his Derby colt Trojan Nation out at 5:45 a.m. Friday to take advantage of a clear track. With Andy Durnin in the tack, the Street Cry colt galloped around the big oval a few times, then came back home to Barn 41. How far did he go, Gallagher was asked? Gallagher reported that he’d gone over to the Lexington area the day before to check on an Uncle Mo foal out of a mare owned by a trainer friend from California, Barry Abrams. The foal looked good. That wasn’t so much the case with the cup of coffee he’d come up with at the barn Friday, however. “This stuff is so strong you could trot a mouse on it,” the trainer said. WHITMORE – One year after experiencing their first Kentucky Derby with Far Right, who finished 15th, the same team of trainer/co-owner Ron Moquett and co-owners Harry Rosenblum and Robert LaPenta are back with what they think is an even better contender in Whitmore. They are all enjoying the second time around even more. “This is an experience that will never get old,” said Chance Moquett, Ron's son. Chance, along with other sons and daughters of Kentucky Derby trainers, has been documenting his Derby experience on Twitter, which can be followed by using the hashtag KYDerbyKids. Whitmore galloped one mile under Laura Moquett during the special 5:45 a.m.training session.